With SXSW recently wrapping and heralding the virtual close of the film festival season (for a bit, anyway), it’s time to sit back and wait for the summer blockbusters to roll in. Sure, the studios picked up some decent independents for major release at your Sundances and South by Southwests, but Hollywood’s golden season kicks off in just a few short weeks. As such, I thought it might be interesting to take a quick look at some recent film news, shall we? •A third Bill and Ted movie? 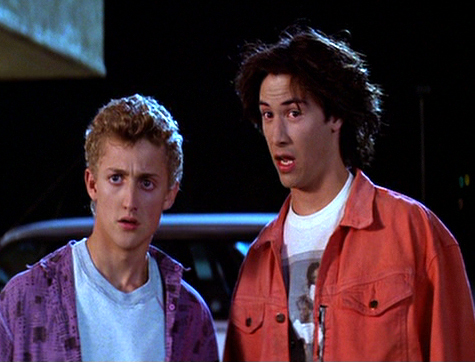 In news that thrills the eleven year-old me, Keanu Reeves recently let slip — according to The Guardian — that indeed a sequel to the absurd 80’s franchise may be making a return with a new sequel to Bill and Ted’s Excellent Adventure. As you’ll remember, the original dealt with time travel while the second, Bill and Ted’s Bogus Journey, saw the Wyld Stallyns in an afterlife journey from Hell to Heaven. According to Reeves, the third film may deal with the duo trying to write the song which allegedly saved the world in Bogus Journey. It’s probably too late for this to be a success, even with a fanboy contingent, and it goes without saying this iteration goes forth without the late George Carlin’s involvement. But I’m imagining it took Alex Winter about one second to agree to this. Maybe less. •A revamp for the Green Lantern. Wondering why you haven’t seen much publicity for The Green Lantern? If you saw the original trailer for Ryan Reynolds’ summer popcorn flick, you may likely agree with the massive community of people who believe it to look terrible. And, truthfully, it did look terrible. It clearly looked way more science fiction-ey than Captain America, less accessible than Iron Man, and more CGI’ed than Cloudy with a Chance of Meatballs. According to some sources, the studios weren’t happy with the way the trailer was testing (but at least something happens in the trailer — take a lesson, Thor), and have revamped the footage for a new marketing push. The new Lantern trailer premiered at San Francisco’s recent WonderCon, and while it does look a bit better, it still looks a little fakey. But that’s just me. Thoughts? •A Conchord returns to the shire. Flight of the Conchord fans likely know that Bret McKenzie, one half of the musical duo, had a brief cameo as an elf in the first of the Lord of the Rings films and one line in the third, and now a New Zealand site is reporting that McKenzie may return for Jackson’s upcoming The Hobbit. If The Hobbit ever even happens. •Peep this new trailer for Robert Redford’s upcoming Abe Lincoln assassination fallout flick The Conspirator, and tell me it doesn’t look pretty damn great. •Hey Lion-O, there you are. San Francisco’s WonderCon also premiered a trailer for an upcoming animated (honest-to-God animation, not computer animation) feature length Thundercats movie, a reveal that likely caused a lot of pants-accidents for the contingent visiting the popular convention. It actually looks remarkably throwback to the old-school Thundercats cartoon. •Mr. Smith goes to Shyamalan. New York Magazine is reporting that Will Smith and son Jaden (The Karate Kid) have signed on with M. Night Shyamalan for an upcoming film penned by Shyamalan himself. The movie will feature the senior Smith as a wisecracking L.A. cop who loves the ladies and has superpowers while the younger Jaden will play a rapping karate hero. I’m just kidding. It’s just going to be way shittier than that.